This weekend I wanted to post pictures of the yummy St Patty’s Day food we made, plus document a craft we were making for a birthday party. BUT – I can’t find my camera! Grrrr.. I cannot figure out where I put it!! I use it so much for this blog, I always know where it is. I am sure it will turn up soon. So – my pictures today are taken from my TERRIBLE phone (no, I don’t have an iPhone.) But I figured some pics were better than no pics! Back in February when I was shopping at the craft store for Valentine supplies, I saw the cutest bee stickers. I thought about Olivia’s friend Charley, who has a bee themed nursery and that her first birthday was coming up in March. 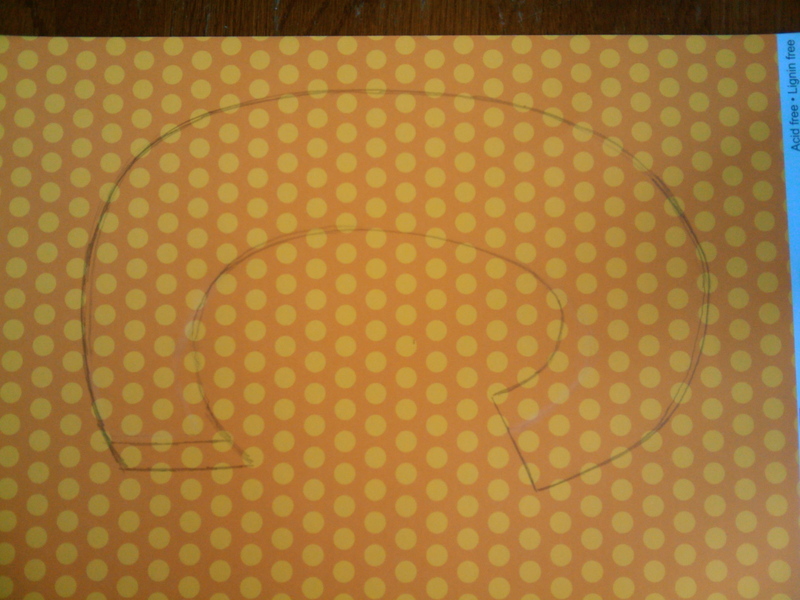 I bought the bee stickers and some other craft paper to make a picture as a gift. I pulled out the supplies to make the craft. We were getting ready for Olivia’s first party as a guest! Notice anything missing? Some bee stickers, maybe? Yup – couldn’t find them. But now it’s Friday night and I can’t go out and get any. So the present had to go on without the bee stickers (even though they were the inspiration!) 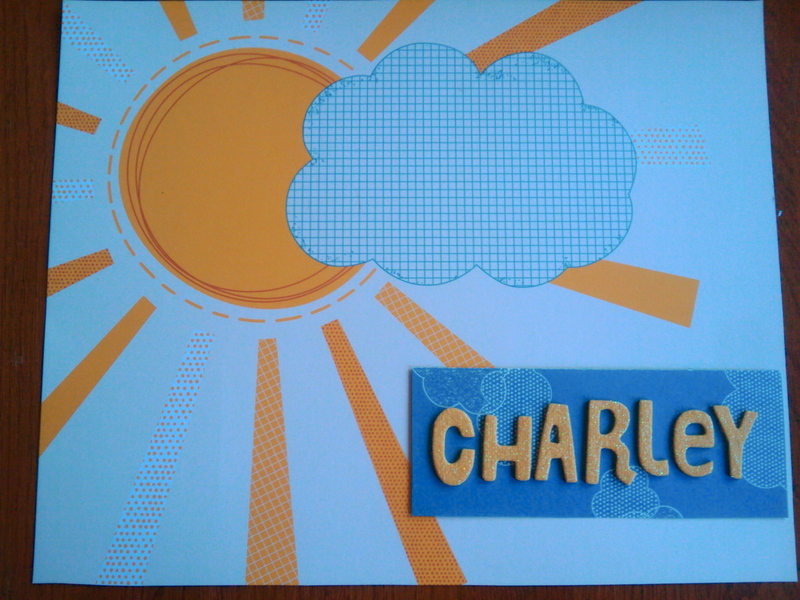 Here is whet we came up with – I finished it off by putting the picture in a white frame. 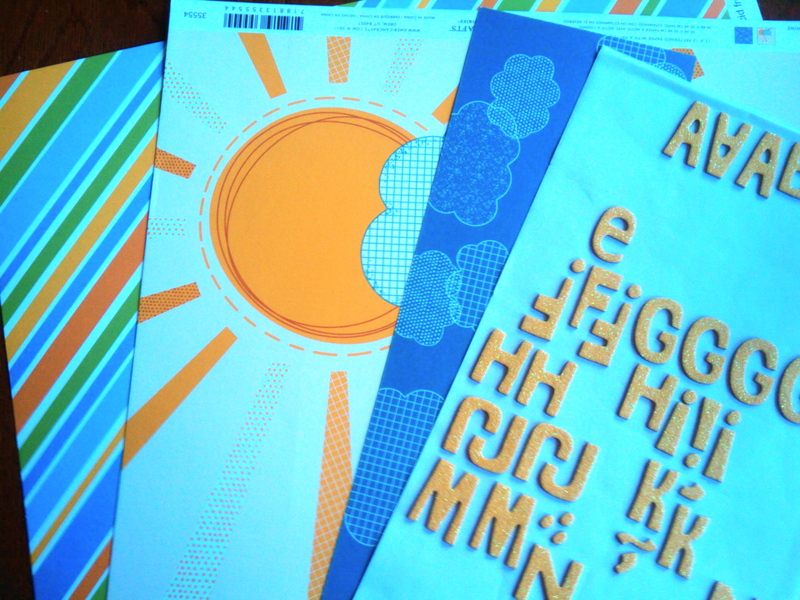 To jazz up the gift bag, I stenciled a “C” on some colorful craft paper and cut it out. Remember to draw letters backwards when stenciling them. 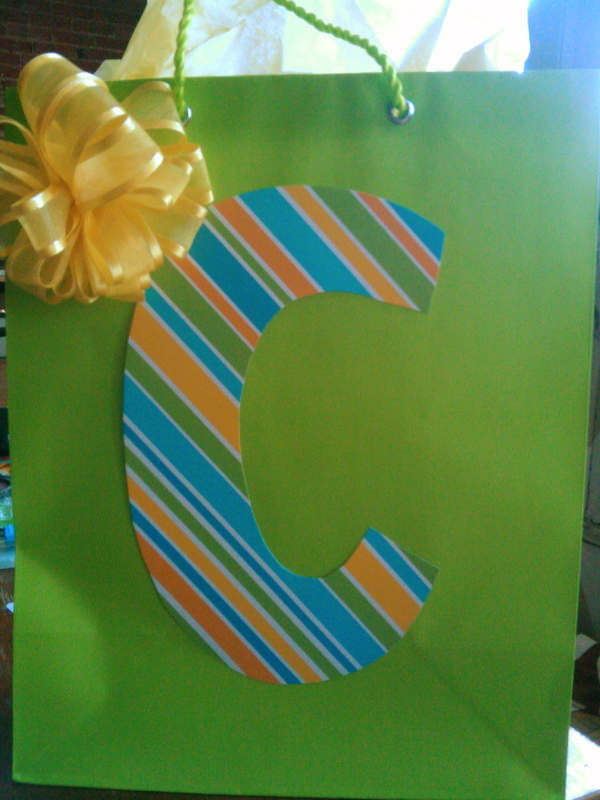 Once I cut the “C” out, I affixed it to a green gift bag, added a yellow bow, and we were ready to bring our gift to the party! I told Charley’s mom, one day soon I will find the bee stickers – and can add them to the picture then. We had a great time at this first birthday party. P.S. For those of you keeping score at home – I am missing my camera and some bee stickers — so much for my organized life lately! Oh well, bring on another week!